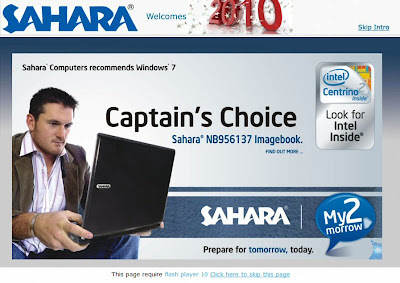 Sahara Computers may understand brand marketing, but they have no idea about customers. They sponsor South African cricket, and put Graham Smith's face next to a picture of their laptops. But when I phoned to get a simple answer to a simple question, I got put through 5 times before I gave up in disgust. Sahara may have a machine called the "Sands", but I'm beginning to visualize an hourglass rather than the Sahara desert. Does that mean it gets clogged with dust? My trusty FRAGG testing machine is a Sahara. I bought it last year and apart from an iffy CD drive (It doesn't always read the CD) and a mouse with Parkinson's disease, all has been well. These are minor problems, and the machine has performed flawlessly in all tests and benchmarks. I just use a different mouse. This year I decided to get a cheap desktop machine for a friend who wants to write blogs. The ZAPS and RebelTech online stores don't list Sahara machines for some reason, so I decided to look on Sahara's own web site. Ouch! I was first presented with one of those crappy time wasting flash main pages, which is great for the Director's ego, but doesn't help the customer one bit. Eventually I found a "back to school offer" page, which looked promising. What? No USB ports? No network connector? Do they really want me to connect to the internet using a dial-up modem? (click on the top picture for all the specifications provided) I figured this must be an error on the web page, along with the typo for "Back to schook", so on Monday I phoned the expensive 0861 number, and spoke to a "support" person who had no idea what machine I was referring to. They would put me though to sales. The switchboard put me through to dealer sales. "Are you a dealer?" No, I'm a customer. "Oh, we can't help you". Back to the switchboard. Transfer again. "Are you a dealer?" No, I'm a C-U-S-T-O-M-E-R. Worried sound on the other end. "That line is busy." So I ask for the name of a dealer in my area, feeling like a drug addict. I get given the contact number for a computer store in Melville. I visit the store on Wednesday to find they don't stock the "Sahara Sands" model. They quote me on a slightly different configuration. I decide to shop around, after being handed a Matrix Warehouse pamphlet at a traffic light on my way to the store. I also visit a few other computer stores. As for the information you requested. Please email me your contact details so that I may call you. Business Development Unit : Sahara Computers 011 542 1166. 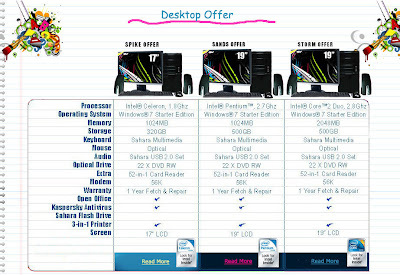 "b) Where is the closest store to where I live (Northcliff/Cresta/Linden in Johannesburg) that has these computers in stock. Most of the large chain stores stock our machines, Ok Furniture, Joshua Doore, Russels, Electric Express, Morkels and Price and pride. "c) I was told by a computer shop that the Windows 7 Starter Edition expires after 60 days. Is this true or FUD? This is not true, it is a full version. "f) How much extra do I have to pay to upgrade from 1024MB RAM to 2048MB RAM? This you would have to discuss with the store, they can give you a price. "I have no idea why it should be so difficult for me to get answers to these questions." This worries me. They sell the computer through furniture stores whose main line of business is finance: they sell furniture and appliances to people who can't afford to pay cash so they get them to pay much more using "easy terms". These are not sophisticated buyers, so they are probably buying the computer for their children in the hopes of giving them a better education. They could easily end up paying R8,000 to R10,000 for the computer, because they wouldn't know better. Yet Sahara won't tell me what the RRP is, allowing the retailers to rip off the public with the collusion of the distributor. This is Africa. I will probably have to spend some time on the weekend traipsing from store to store, speaking to idiot sales staff with blank expressions who won't know what I am talking about. I am really looking forward to this. Maybe I'll just buy a different make from someone who knows what a computer is, and can identify a C-U-S-T-O-M-E-R when he walks in the door. Update: One other point of interest: they bundle Kaspersky AV with a one month subscription, when they could include the free offerings from Microsoft or AVG. Did Kaspersky pay them to do this? Or don't they know about the free products? After all, they include all the Windows Live software. Update 2018: Sahara Computers has closed doors after their owners were implicated in massive theft, fraud and government corruption on a grand scale. Does your computer have a Droid yet? Customer Complaints: can a free model work?